Out of all of the books I’ve written, this is the one. The one that earned me the contract with The Gernert Company, the one that prompted meetings with a Simon & Schuster editor, the one that sparks the most feelings, and the one that will stay with you long after the last page. This is my literary pride and joy – my magnum opus. Politics is one of those touchy subjects that can be easier to avoid than handle delicately, yet it has always fascinated me. 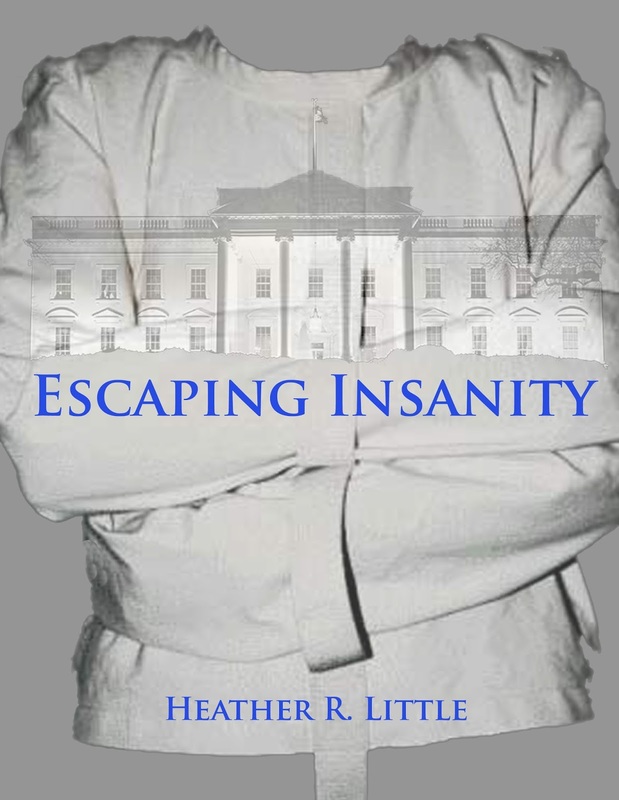 So two and a half years ago, when I started writing Escaping Insanity, I set the story in the middle of a Presidential campaign. At the time, I couldn’t have predicted the circus we now find ourselves in, but artistically all of this drama works in my favor. 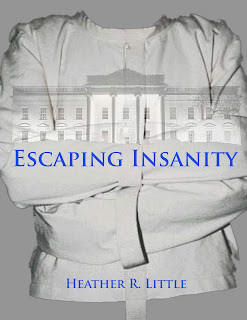 Still, there’s so much more to Escaping Insanity than the political story-line. In fact, politics isn’t even the most taboo topic I explore. Because this novel also exposes the prejudices we have toward people with mental health disorders, and illuminates the stigma they face just trying to live their lives. Escaping Insanity doesn’t advance the cause of either political party, but instead campaigns for truth, logic, and the greater good. That’s a winning ticket we should all rally around. The themes of love, forgiveness, accountability, and hope are the true backbone of this book, and those are completely bipartisan. WHO WILL GO WITH ME?! 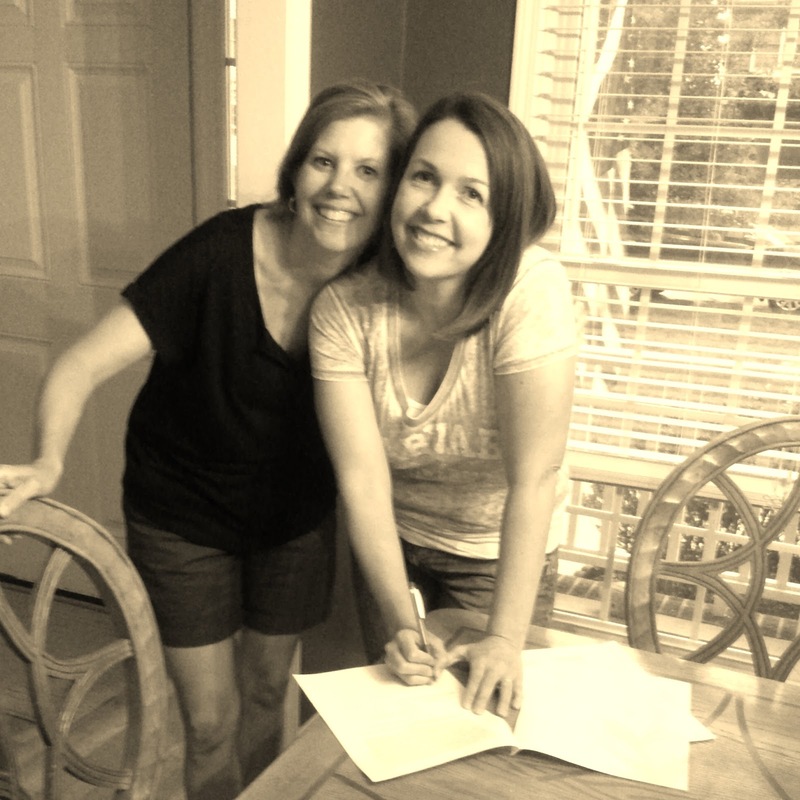 In May of 2015, I was signed as an author by The Gernert Company literary agency in New York. Among other notable clients, The Gernert Company represents fiction industry leader John Grisham. So, as you can see, I was very optimistic when they pitched my novel Escaping Insanity to ten editors of big-name publishing imprints. Ultimately, we received nine responses essentially saying, “I love this, but it’s not for me,” and then one response of, “I’m interested in making an offer on this novel,” from a Simon&Schuster editor who met my agent for drinks to discuss her interest in my book. The manuscript was then forwarded along to the Editor-in-Chief for a final approval that we never received, possibly because the editor who wanted to purchase Escaping Insanity left her position there to become a talent scout with a competing literary agency. It was a tremendous disappointment to say the least. At that juncture, my agent decided we should turn our attention to novel number four, East of Oz, and for the next ten months, drafts, suggestions, and revisions were passed back and forth. The novel was ultimately read and sharpened by the majority of the staff at The Gernert Company. Finally, late this summer, East of Oz was polished and ready to go, but my agent surprisingly decided not to pitch it to a single editor, because – in the deciding opinion of publishers – there is no longer a market for “light” commercial fiction, unless it’s coming from a well-established household name like Nicholas Sparks. Readers, editors say, want dark, edgy, scandalous, and shocking, not unlike moviegoers and television viewers. And these gate-keeping editors of New York publishing don’t want to see something by a first-time author if it isn’t those things. Well, I’ve decided to stand my ground, the middle ground you could call it, between unbelievably prudish and recklessly indecent. And with the agency’s blessing I’ll be offering these two novels directly to readers through Amazon. I would rather reach fewer people with nourishing prose than poison the masses with more literary pollution. Bad is not the new good, villains are not the new heroes, and each purchase and online review made by you – the consumer – sends a clear message to the people controlling all media venues that there is still an audience for exciting, humorous, even heartbreaking stories that focus on the triumph of the human spirit, the resilience of hope, and the beauty of becoming a better person. I hope you all find the time to read East of Oz and leave me a review. Not only will you have hours of entertainment, you’ll also be a part of a grass roots movement to bring back moral restraint in mainstream media! "Who will go with me?!" - Jerry Maguire. A friend texted me later that day to see how I was feeling because she knew I'd been battling a relentless cold. I texted back "Wondering if I need a lung transplant." She immediately offered to donate a lung to me, citing two important factors in her decision, "I'd get to come and hang out with you AND lose weight!" With friends like these, who needs U.N.O.S. It's not that I'm such a wimp in the face of a cold virus. Part of the problem is that my heart condition doesn't mesh well with lingering illness. When I'm completely "healthy", my resting heart rate is 43 and my blood pressure is 90/60 if I'm lucky. I take a daily non-Barry-Bonds-type steroid to keep my blood pressure at least that high or higher, and in emergencies I supplement with Doritos. It's a manageable, if thigh-spreading, system. Until I get sick. Then my heart is like, I'm tired, let's rest for...I don't know, forever? And if I try to do too much, my blood pressure insists I sit down. Immediately! It will go so far as to turn the lights out and bring the house down. One day I'll get a pacemaker and my heart will have no choice but to behave, in sickness and in health. It was going to be guesswork as to when I needed to get that. No one rushes to put a pacemaker in 36 year old with manageable symptoms. But thanks to advances in heart monitoring technology, we won't have to guess. I'm having a recorder/monitor implanted in three weeks and then my cardiologist can see exactly what's going on in there all the time. Or so he says. I realize, thanks to Edward Snowden's disclosures, that this could be a big government conspiracy to get a tracking device in me. They must be aware of my international spy aspirations and desire to get Republicans back in the White House. And clearly I'm a threat if they are going to such great lengths to get a microchip in me. But don't worry, I've seen many a movie character cut those things out; I could probably do it in my sleep. Which is the condition I find myself in more often than not these days. Since I'm at my kids' school all the time anyway, I decided to apply to be a substitute teacher. Getting paid to do what I was already doing was a genius idea, so, obviously, not mine. I have the occasional brilliant idea, but they are never ever finance-related. I like making friends, making jokes, and making cookies, but making money has always been pretty far down my to-do list. Also, making to-do lists is pretty far down my to-do list. Initially, there was a lot of paperwork to prepare. An extensive application, reference forms, a list of additional references, and the references addendum. Basically, all of you should have received a phone call from Wake County Public Schools wherein they asked you to vouch for me. I also needed an official copy of my college transcripts. For the first time ever. I've had to give proof of my degree before for one other job I had like ten years ago, but honestly, I could have fooled those people with a home calligraphy kit and some decent card stock. But this was sealed transcripts! And it was so fulfilling to have someone other than my parents see that A+ I got in World Lit. that I may apply for more transcript-required jobs just to show off. After I was approved, which had to be related to my stellar performance in Western Civ. circa 1996, I received another large stack of papers to fill out. So I went at it again, with my best I-could-be-a-school-teacher handwriting, only I had my husband fill out the W4s (W2s?) whatever those tax thingies are, and my direct deposit forms. He knows our routing number, I don't even know what a routing number is; it's easier. Anyway, he handled that task chicken scratch style and I was worried he was job-blocking me, but alas they hired me despite his poor penmanship. Then my doctor said, "While you're here, you should get the flu shot." Now, I like needles as much as the next girl, but playing human pin cushion for a day isn't really my thing. Yet, I didn't want to go back a different day, so "Okay." She sent the nurse back in with another syringe and the nurse asked, "Which arm do you want it in?" Ummm... "Yours?" She laughed and jabbed it in my left shoulder. I survived. I'm an official substitute, and I worked exactly two days before going on vacation. But in all fairness, this Disney trip has been 36 years in the making and I only decided to start substitute teaching a couple of months ago. Tune in next time to see if I successfully smuggled a manatee out of Sea World. It's gotta be easier than becoming a substitute. Mondays are rough anyway, so why not have an endoscopy, right? Especially if you are sick and tired of your esophagus revolting against everything you even think about eating. An endoscopy, for those of you that don't travel in gastrointestinal health circles, is an INVASIVE procedure where someone runs a scope down your throat to look around in there, and, if they feel so inclined, scrape off some samples with a weapon of their choosing. The scope is smaller than a hunting scope on a rifle, but still big enough that they have to knock you out to do it. Anesthesia is a fun trip, assuming you come back from it. One minute I was staring at a room full of people in scrubs and hooked to a bunch of machines, and the next someone was waking me up in a totally different location with nary a nose cannula in sight. Where am I? How did I get here? When did I get here? Where's the nice man with the drugs? Once I got my wits about me, my first real question was "What did you find?" Obviously, I wanted the answer to be nothing, for them to say I'm healthy as a horse with the silky mane of one too. But because this procedure cost us hundreds of dollars, I did sort of want them to find something. Something that warranted the expense. Like maybe if they had found Jimmy Hoffa down there, it would have all been worth it. They didn't find Hoffa, or gold, or anything worth the tools they sent down. What they saw was a very angry and irritated looking stomach and esophagus. I don't know what my stomach has to be irritated about, I'm the one who can't eat Mexican food or chocolate! The doctor did take some soil samples on the way down, just like NASA does every time we visit the moon. He won't know if my stomach can sustain lifeforms for a couple of weeks, but in the meantime he gave me a prescription to help with my symptoms. And the nurses gave me a pamphlet on what not to eat. It includes everything I've already eliminated plus TUMS fruit smoothies. Apparently TUMS (a.k.a. extra calcium) can create more acid in your stomach. Guess what I've been self-medicating with for weeks? Reason #256 of why you can't get a medical degree from a cracker jack box. So, I'm "recuperating" now. It involves lying around in the new fuzzy socks my mommy bought me for my procedure, eating mashed potatoes she made me for dinner again tonight, and holding a small memorial service for the Halloween candy I won't be eating this year. I feel okay, but not great. My throat feels like someone shoved a rusty pipe down it and I'm not allowed to take the edge off with Sprite or Ginger Ale, which stresses me out, which creates more acid in my stomach, which is lighting my sore throat on fire, which is why, United Healthcare, I need a vacation with Jim Gaffigan! I can't remember exactly when this rainbow loom fad came to my attention, just that several months ago these stretchy bracelets started showing up on my girls' arms. They looked like a nicely woven mess of those colored rubber bands I used on my braces back in the 80s. I don't think those were getting much mileage on braces anymore, what with the invention of Invisalign and good common sense, so I assume whoever was storing those sold them to patient zero of this infectious loom disease. It might be more than I don't succumb to fads, I might be fad resistant. Last year all the boys my son's age had to have Nike Elite socks. And Brainy begged and he pleaded and he felt insecure about his regular tall black Nike socks, but those Elite socks are like fifteen bucks a pair and they just go on your smelly feet, so no. And women have been wearing scarves around their necks as accessories for years now and I've yet to buy one. I have a warm gray scarf I wear with my winter coat when it's freezing outside, but my neck doesn't stay cold year round, so I go without most days. I don't know if I haven't gotten into those because I'm fad resistant or because I don't want to have to learn how to tie one properly. I learned how to tie my shoes when I was four, shouldn't that be enough? But this comeback of the loom is a surprising one. Weren't looms popular hundreds of years ago, like pre-Industrial Revolution? Is our economy in such bad shape that we're training child laborers to operate looms again. Is this where we're headed when the bubble finally bursts? Is a return to steam engines and blacksmiths far behind? Will the whole country start to look like Colonial Williamsburg again? For now I'm just going to keep my kids in school, working with iPads and Smart boards, gambling that I don't need to teach them to grind their own flour. Whereas, apparently, the rest of you have already pulled yours from school to work in rainbow loom sweatshops all day. How else can you explain some of these girls that have rainbow loom bracelets up to their elbows on both sides and hanging around their necks like to-go nooses? I had a fourth grade girl sitting next to me in reading group this week who seriously had so many rainbow loom bracelets that I thought if she took it just a little further, she could have full body armor and therefore be able to repel spears if and when Native Americans throw them at her. I also have to point out that this isn't just a trend with girls. My son has had boys over here to play ball with him and they have to remove their "bracelets" before they go out for a catch. Stretch and Reckless may always hold their lack of a loom against me, but my son will thank me someday. I will also admit that for the first two or three months the girls were talking about these bracelets, I thought they were saying Rain Balloon bracelets, not Rainbow Loom bracelets. I'm not sure there's a difference or if it matters; I'm not even sure they weren't saying Rain Balloon. But I have started calling them by the right name, just in time for the next big thing to come along.